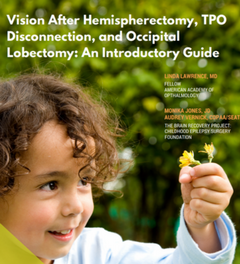 This guide summarizes the various visual impairments a child will have after hemispherectomy, TPO disconnection, and occipital lobectomy, and how they can affect a child’s daily living, functional mobility, and access to the educational curriculum in school. 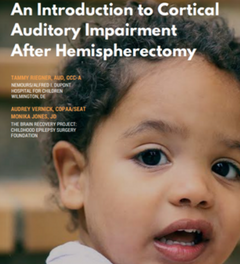 This document provides educators and aligned professionals with an overview of the challenges a child after hemispherectomy will face in school. 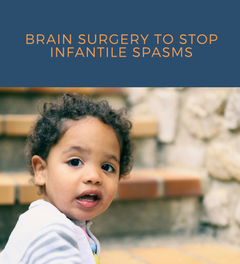 This guide introduces your patient’s parents to the concept of stopping infantile spasms with brain surgery. Written by parents, for parents, it makes clear that infantile spasms can have catastrophic consequences if they are not stopped early. Drug resistant seizures can be catastrophic to development. This guide helps explain the serious implication of intractable epilepsy in childhood. 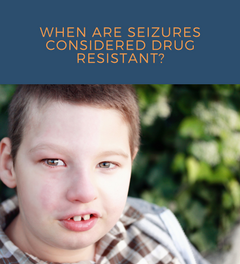 WHEN ARE SEIZURES CONSIDERED DRUG RESISTANT? 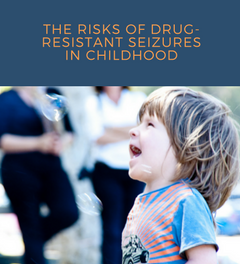 Drug resistant seizures are defined as failure of two appropriate and tolerated anti-epileptic drugs. 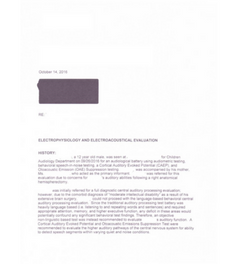 This guide breaks down the International League Against Epilepsy’s definition of drug resistance. 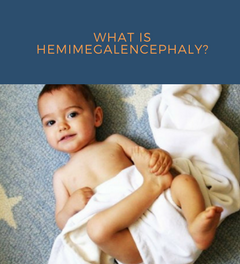 Hemimegalencephaly is an extremely rare condition, where one half of the cerebral cortex is larger than the other, often requiring hemispherectomy. This guide helps parents understand this very rare condition. 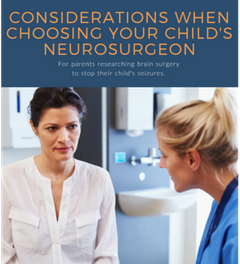 How experienced is your child’s neurosurgeon? Is your team the right fit for you? This guide informs you of some qualifying factors of an experienced neurosurgeon and what key questions to ask. Hydrocephalus occurs in approximately 23% of children after hemispherectomy and carries the risk across a lifespan. 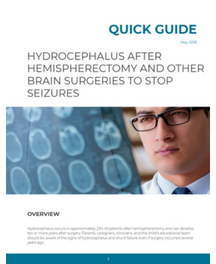 This fact sheet summarizes the symptoms of hydrocephalus, imaging challenges, and other data from published research. 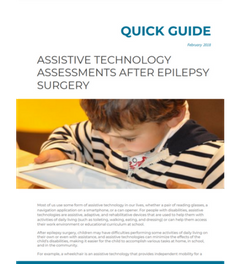 After epilepsy surgery, children may have difficulties performing some activities of daily living on their own or even with assistance, and assistive technologies can minimize the effects of the child’s disabilities, making it easier for the child to accomplish various tasks. There are many management options to address Central Auditory Processing Disorder. These can include therapeutic and environment interventions and compensatory strategies to help the child to be as successful as possible. 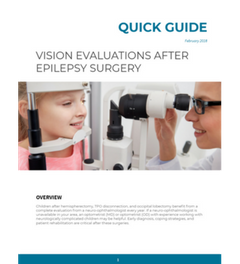 A complete annual evaluation from a neuro-ophthalmologist is beneficial to children after hemispherectomy, TPO disconnection, and occipital lobectomy. Early diagnosis, coping strategies, and patient rehabilitation are critical after these surgeries. 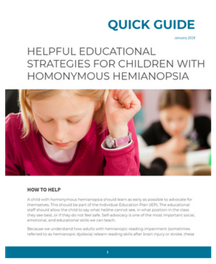 A child with homonymous hemianopsia should learn as early as possible to advocate for themselves. This guide provides key strategies for one of the most important social, emotional, and educational skills we can teach, self advocacy. 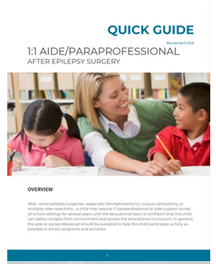 Children after epilepsy surgery often require a 1:1 aide to help them navigate their school’s physical campus safely and sometimes to access the education curriculum. This brief info sheet describes how a dedicated aide can help a child after surgery. 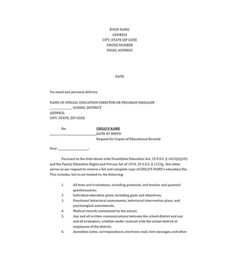 Use this letter to request a full and complete copy of your child’s education file, which is your right under federal regulations. This FAQ from the U.S. Department of Education’s website does a great job of explaining when a photo or video of a student is considered an education record under FERPA. There are many assessments a child should have after hemispherectomy surgery as part of the overall comprehensive educational evaluation. 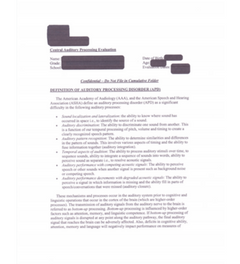 This letter advises the school district of the category of assessments that should be conducted. If you disagree with even one of the assessments conducted by the school, you can request an independent educational evaluation. 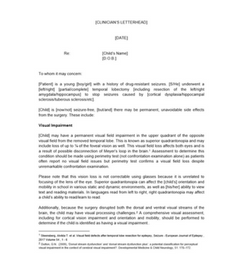 If the school does not assess your child in an area of suspected disability, you are also entitled to an independent evaluation. 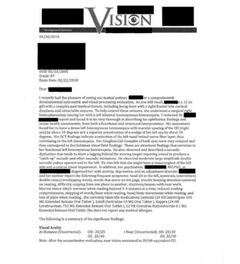 This letter requests these evaluations from your school district. 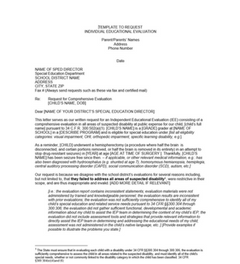 Before your IEP meeting, be sure to have your child’s neurologist or neurosurgeon sign this letter. 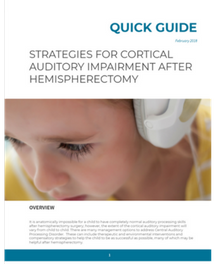 It outlines the possible disabilities your child may have after hemispherectomy surgery, which should trigger various assessments by the school. 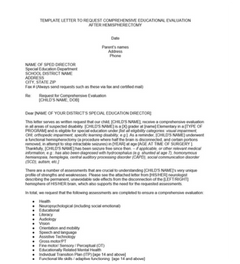 Before your IEP meeting, be sure to have your child’s neurologist or neurosurgeon sign this letter. It outlines the possible disabilities your child may have after temporal lobectomy surgery, which should trigger various assessments by the school. This report allows the team a quick view of the child’s needs, goals, accommodations, and services. The Reading Brain: Neuroscience and Assessment Implications After Hemispherectomy – This presentation by Joanna Christodoulou, EdD at the 2017 Pediatric Epilepsy Surgery Conference and Family Reunion reviews the fundamentals of reading, reading circuits in the brain, and what appropriate assessments should cover after hemispherectomy surgery. Legal Rights of Children With Epilepsy In School and Child Care – An excellent overview of the legal rights of children with epilepsy in school and child care, including an in-depth discussion of the Individuals with Disabilities in Education Act and Individual Education Plans (“IEPs””), the Rehabilitation Act and 504 Plans, and administration of rescue medication in various educational and child care settings. Voice Dream Reader – Shortens length of sentence being read to a few words per line. 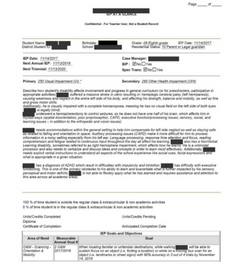 Highlights word being read. 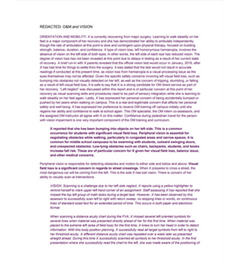 Combines visual reading with auditory listening by highlighting text while audio reading. Seamlessly merges audio and visual reading. 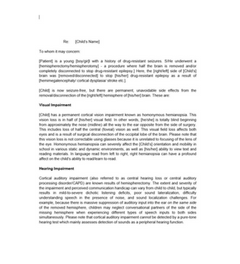 Homonymous Hemianopsia Simulators – from Vision Rehabilitative Services, LLC. Rummel Hemianopsia Buttons™ – These simple buttons remind others that your child is unable to see in their blind field. Rummel Hemianopsia Guides™ – Reading guides that remind your child to read to the end of the line (for right hemianopsia) and w Save here to begin at the next line (for left hemianopsia). Highlight reading strips – flexible, transparent colored strips that highlight the line the student is reading while blocking out the line below. E.Z.C. Reader Strips™ – feature a tinted transparent “window” that helps pop print into view. 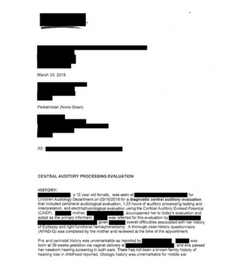 Dark area helps block distractions surrounding targeted words, so eyes are easily guided to the desired print. What Works Clearinghouse reviews the existing research on different programs, products, practices, and policies in education. The goal of the website is to provide educators with the information they need to make evidence-based decisions. Its focus is on the results from high-quality research to answer the question “What works in education?” If your school says that they’re providing “research-based” interventions, take a moment to search this website to see if the program is in fact supported by research. 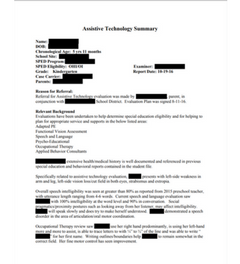 Techmatrix.org – Search a database of nearly 400 products using extensive criteria tailored to assistive and educational technologies. International Alliance for Pediatric Stroke unites worldwide pediatric stroke communities to make a difference together. Share your guide or product with us! If you know of a product or guide that has helped your child or student in school, let us know!